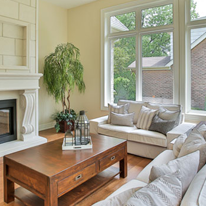 OAKVILLE, ON – Urban Barn blogs about our Lakeview House. We shared these lovely photos of the living room, upper hallway and master bedroom, which feature pieces from the Urban Barn Post and Rail and Calypso Collections. They caught up with Michelle to find out more about DCAM’s inspiration for these rooms.